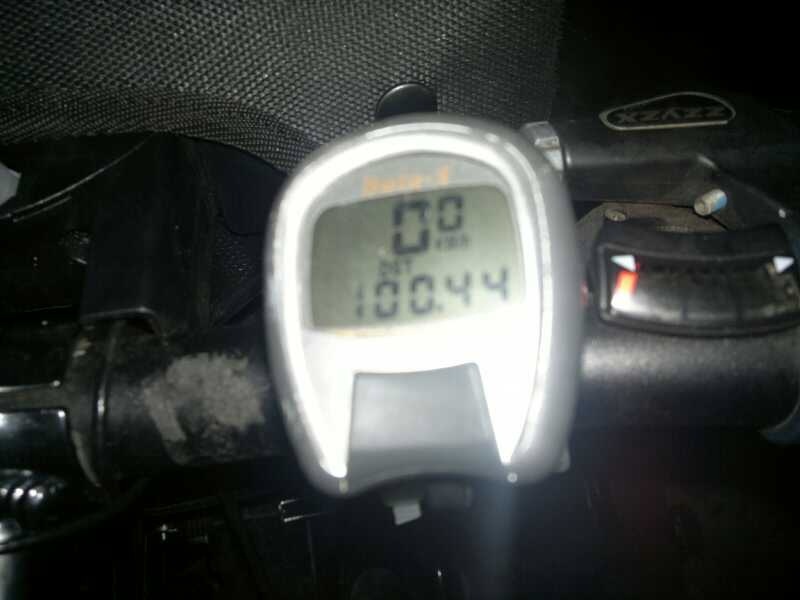 Despite the winds, Jolandie managed 100km in ONE day!! Jolandie does a happy dance because the wind changed from head to tail! 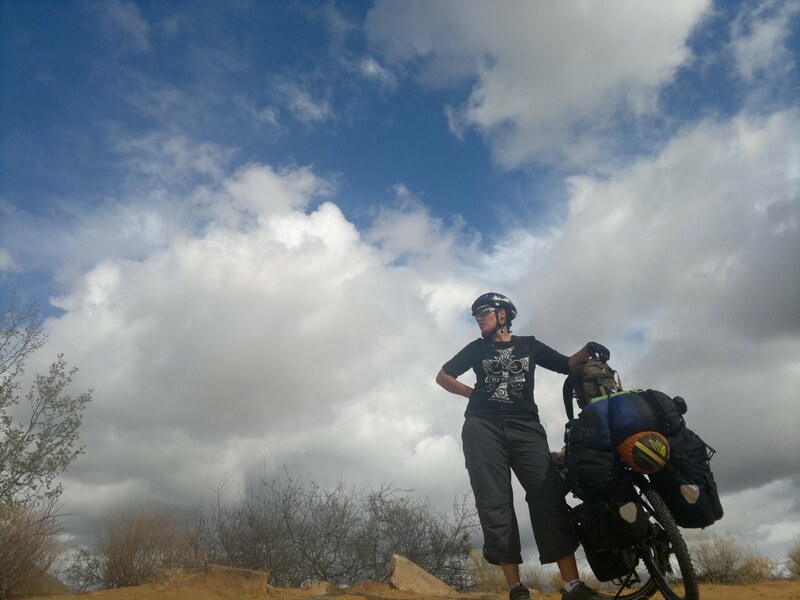 Jolandie has met so many interesting and supportive people along the way – word of her ‘Cycle for Eduction’ is spreading and you can be sure that, in Windhoek, she will be met with a mighty reception! Jolandie will soon enter Namibia – What is the education system like? In a couple of days Jolandie will be crossing the border into Namibia – South Africa will be behind her and the rest of the journey up ahead. Jolandie says, “For me, the adventure starts here”! 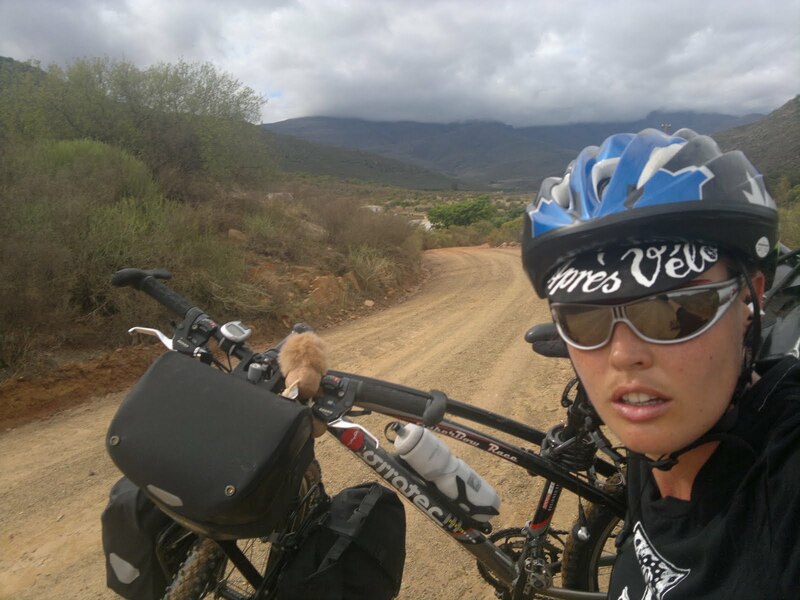 The education situation in Namibia has recently been entering the news and so Jolandie could not have better timing on her ‘Cycle For Education’ tour. However, a year later the situation remains worryingly below acceptable. In mid-April of this year Dr. Abraham Iyambo delivered harsh criticisms of principals, education inspectors, advisory teachers, and textbook officials in Namibia. Dr. Iyambo stated that he has often witnessed teachers and principals arriving to their school unprepared, late or even drunk! Inspectors frequently fail to reprimand the principals not performing to national standard and the interaction between each level of administration within the education sector is poor. (Source: AllAfrica). Of course, a sub-standard education sector will limit the opportunity the country’s youth have of betterment through higher education. 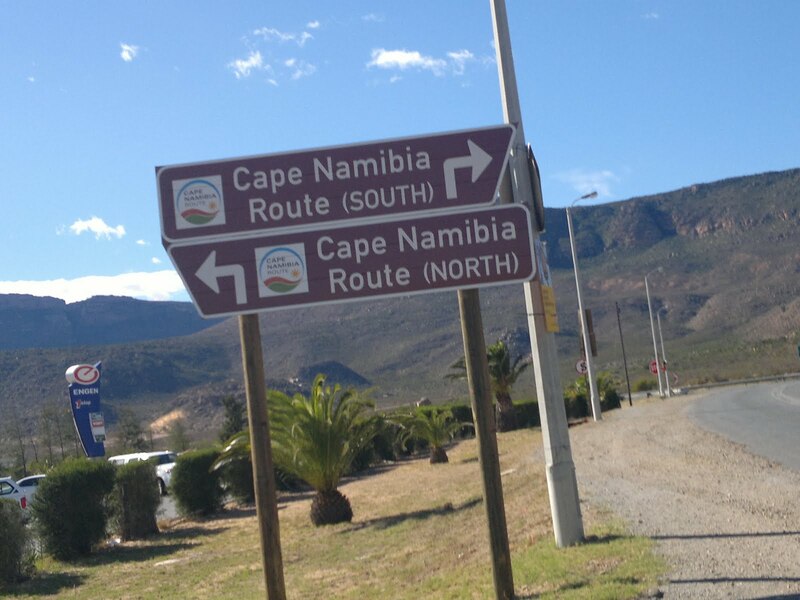 Jolandie’s cycle tour through Namibia will coincide with the build up to the National Education Conference to be held in the capital from the 27th June where Dr. Iyambo will directly address these issues. Representing Iduka when travelling the country, Jolandie will raise the bar of the education stakes for the Conference (and will hopefully point a few students and volunteers our way!). 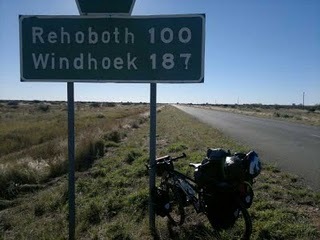 Jolandie will soon cross to Namibia! 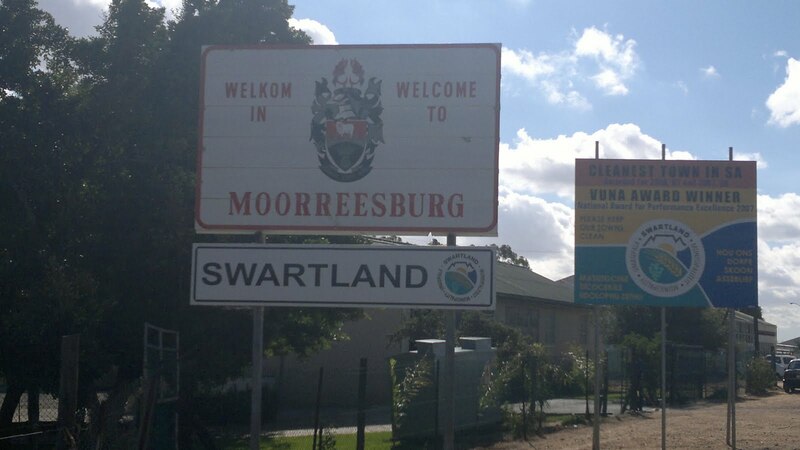 Clanwilliam –> Klawer –> ‘Oom Buys Wiese farm (25km outside of Vanryhnsdorp). On the Clanwilliam to Klawer leg of the journey Jolandie met a holidaying couple from Robertson and she chatted to them about her ‘Cycle For Education’ Tour. Unexpectedly, they offered her R100 (local currency) in order to contribute to her journey… with spirits high and confidence in the goodness of humanity she tackled the rest of the day’s journey with ease! Unfortunately, from Klawer to ‘Oom Buys Wiese farm she faced the strength of Mother Nature and a cyclists worst enemy: harsh winds. 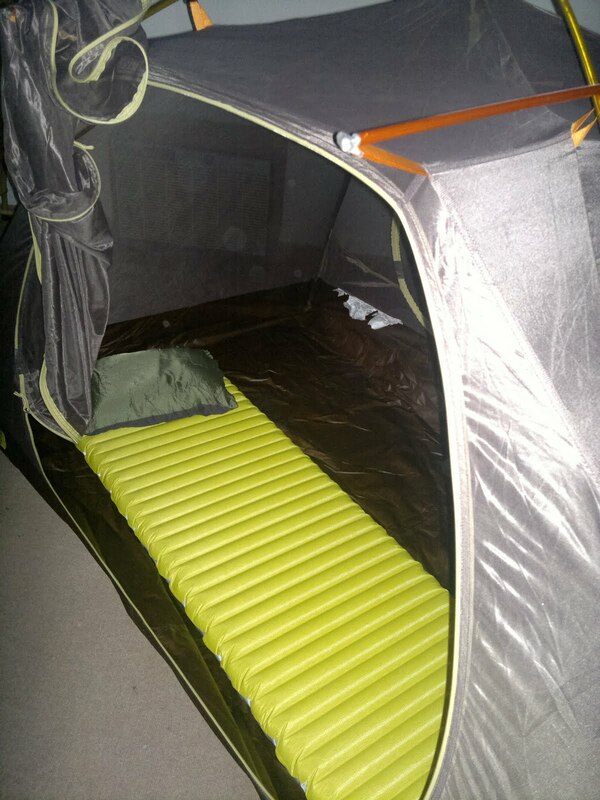 The day was slow and extremely tough, when she finally parked up for the night, Jolandie spent her first night in the tent… alone. “It was great!” Jolandie declared – she cooked her supper on a little stove and slept like a baby. Unfortunately Die Knersvlakte, or the ‘Grinding Plains’, remained. According to Jolandie, “The roads just go on forever and ever and ever…and EVER! !” and on top of that, the wind met her head-on. After a flat tyre and a small collision with the road she made it to Bitterfontein just before sunset. 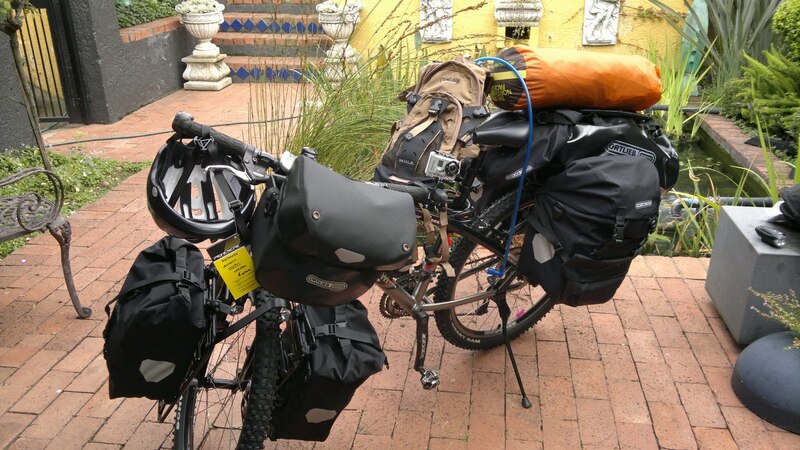 After just over a week on the ‘Cycle For Education’ Tour, Jolandie has experienced enough to fill a month! Crowds gave her a fantastic send off from Cape Town on the 27th April, but misfortune struck on the following day… Jolandie fell ill with flu. 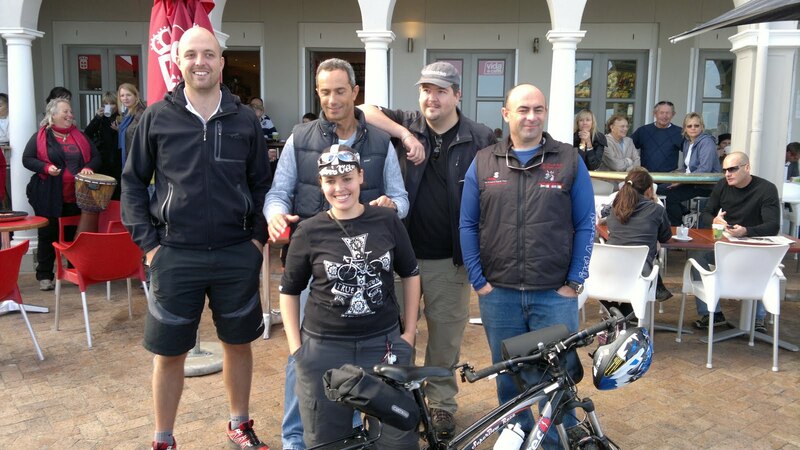 Cycling 50km, she made it to Malmesbury and then was forced to rest for a little while to recover. 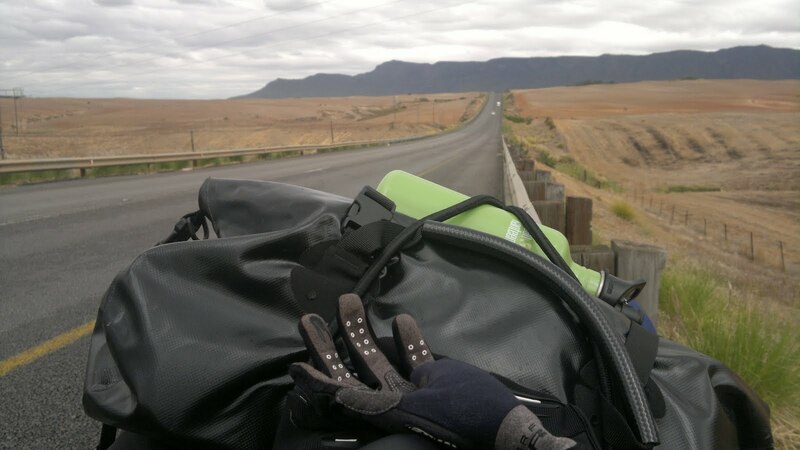 Pushing forward, on day three, Jolandie managed to make the cold and windy journey to Moorreesburg, but the illness would not shake off! Moreover, weather forecasts predicted rain from the 3rd May until today… so Jolandie decided to take a few days to rest and recuperate. She will need full strength for what lies ahead and already the elements have pushed challenges in her way. Namibia will be holding a national ‘Conference on Education’ from June 27 to July 1 in the capital city, Windhoek. The Conference will provide an in-depth analysis of the education system at all levels and will seek to improve the system for ‘Quality Learning Outcomes and Quality of Life’ (Source: The Namibian). Jolandie’s Cycle for Education through Namibia could not be better timed – by delivering her open letter to the leaders of Namibia when she crosses the border, Jolandie will be helping to raise the profile of higher education at a time when the country itself will be reflecting on educational issues. Iduka Partnership with A.I.D. 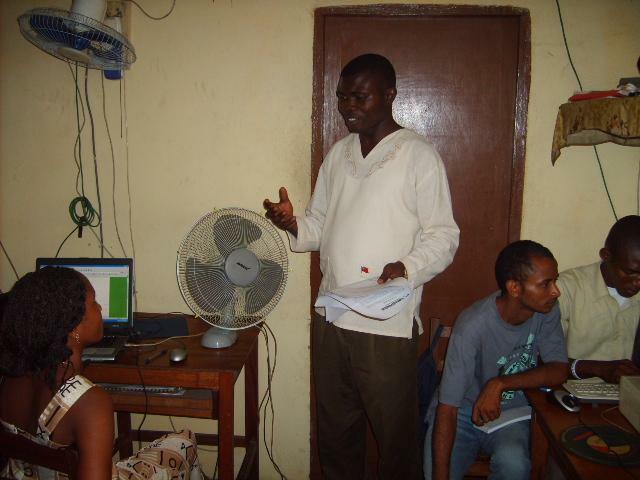 (Advocacy Initiative for Development) in Sierra Leone! Iduka is proud to announce a partnership with Advocacy Initiative for Development (AID) Organisation based in Sierra Leone. AID began as a youth services agency but, after incredible success, has expanded to encompass broad-based programmes that offer educational and vocational training, advocacy for human rights, and services that promote the development of whole communities. AID has now taken on the role of Iduka Field Partner as part of Iduka’s Africa Pilot Project (iAPP), and will have the important responsibility of selecting, supporting and developing Iduka’s scholarship recipients. 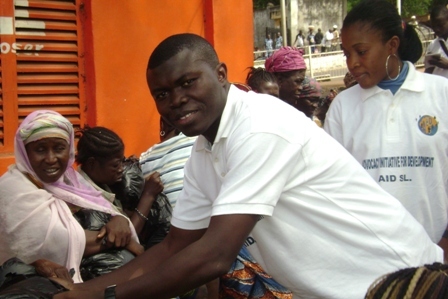 Mr. Sylvannus Murray (pictured) is the founder of AID and is now a Vice Chair on the Executive Committee for Iduka, assisting student development in West Africa. Conducting follow-up interviews to make sure the students are getting all the support they need, and are actively volunteering in their community. Of course, no student can benefit from Iduka’s education scholarships without a committed Field Partner working within the community to provide the vital student support. Moreover, local Iduka volunteers rely on Field Partners such as AID for leadership, mentoring and opportunities to make a difference. The networks and relationships that will result from the AID-Iduka partnership will create international awareness of the importance of higher education in Africa, and this partnership will also offer more education, skills and livelihood opportunities for students in Sierra Leone. With this level of commitment to the development of African nations it is certain that, together, Iduka and AID (and all of Iduka’s partners) will push forward the post-secondary education agenda in Africa. Cycle For Education Day 1… Photos! Jolandie was overwhelmed by the amount of support for her yesterday: ‘I, in all honesty, could not have asked for a better start to my journey’, she said. Jolandie prepares for take off! 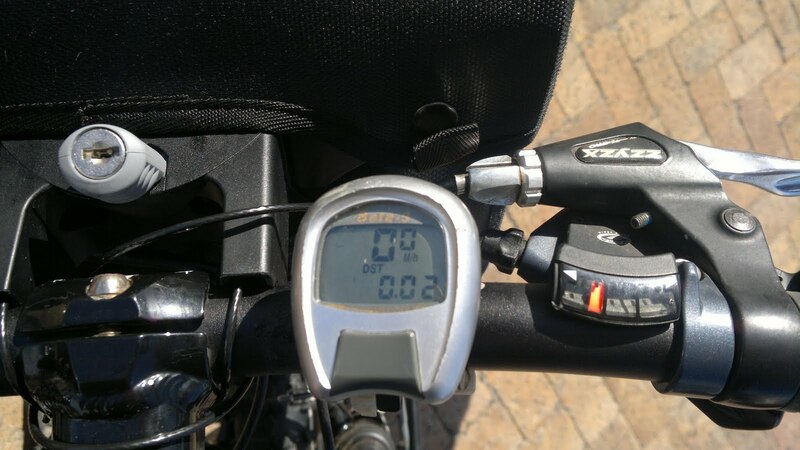 Jolandie covered 50km on her first day! She spent the night in Malmesbury and has many more destinations up ahead. 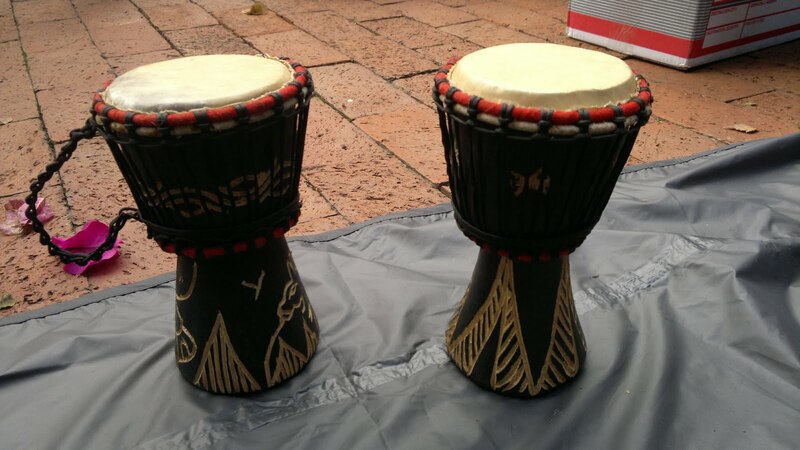 Updates on Jolandie’s ‘Cycle for Education’ for Iduka will, of course, appear on this blog on a weekly basis 🙂 … keep checking for all the latest! 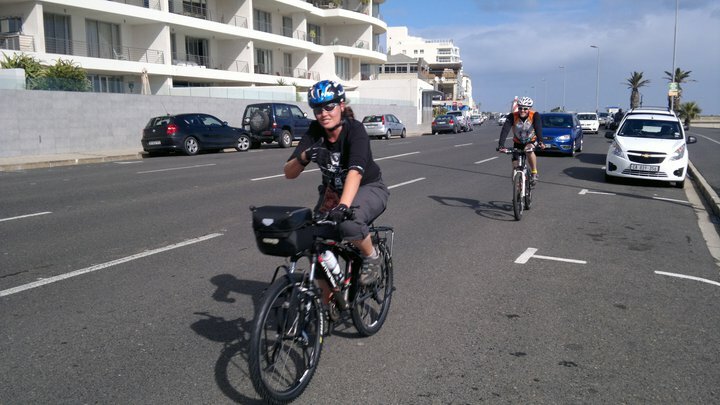 Jolandie Rust departed at 10am this morning for her ‘Cycle For Education’ tour of Africa! Today (27 April) is also known as Freedom Day in South Africa – it is a day that celebrates South African democracy, hope, and opportunity. 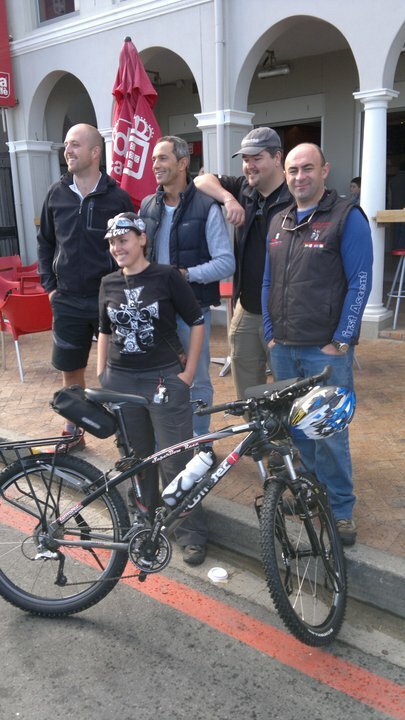 It couldn’t have been a more fitting day for Jolandie to depart for this epic cycle. Waved off by a crowd of friends and supporters, Jolandie set off on the open road with the sun on her back and the rest of the continent ahead. As Iduka’s Good Will Ambassador, Jolandie will be delivering an open letter to African leaders in each country she cycles through, calling on them to promote and protect higher education in Africa. She is due to cross over to Namibia in two weeks or so and there will be many cheering her on along the way. Moreover, in partnership with Iduka, Jolandie will be raising funds and awarding scholarships to local students along the way. A vital aspect of this role will be for Jolandie to mobilize volunteers in all African countries! If any of you, the readers, would like to offer your time, support, or even just words of encouragement for Iduka and ‘Cycle For Education’, please raise your voices high and let Iduka know… we can support Jolandie’s dream together. The last words on this first day will rest with Jolandie… When asked how she feels about this challenge, she replied, “A little nervous, but very excited! I’ve been waiting for this for a very long time!” Go for it Jolandie! Iduka is behind you every peddle-push along the way. Jolandie's bike - all ready to go! Tomorrow, April 27, Jolandie Rust will be setting off from Cape Town to begin her 2 1/2 year circumnavigation cycle around Africa. Of course, today is full of last minute preparation and family goodbyes… the road ahead will be a long and difficult one but Jolandie, with Iduka, will be making such a difference to those she meets along the way. What does one take on such an adventure? Well, first and foremost Jolandie will have her open letter, which is addressed to the African Leaders of each country she will travel through. As Goodwill Ambassador for Iduka, Jolandie will be presenting this letter to African leaders in the hope that it will inspire them to recognising Iduka’s cause in promoting and protecting higher education in Africa. Third, she will have her mobile phone – this vital piece of technology will be her only communication tool to contact us here at Iduka. With this we will hear every detail of the journey – the students she connects with, the volunteers she mobilises for Iduka, the African leaders she delivers the open letter to! And last – but by no means least – she will have everything else… family mementos, a camera, sleeping bag, first aid kit, bicycle repair kit, bicycle lock, water flasks, cooking equipment, hot weather gear, wet weather gear, cold weather gear, helmet, sun hat… the list is long and the bags are overflowing! 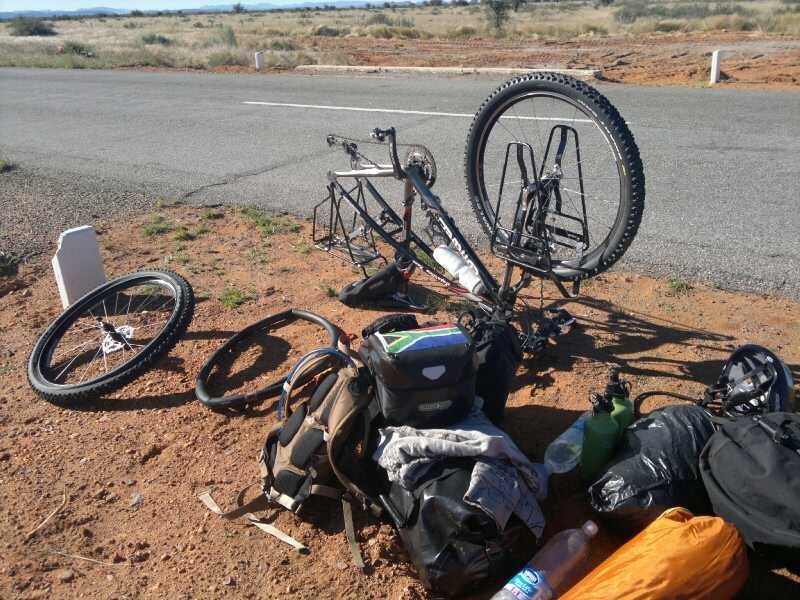 If you were embarking on such a journey – 2 1/2 years on the open road with only a bicycle for transport – what “luxury” items would you take? Photos of loved ones? A journal? A musical instrument? Your lucky mascot? If it was me, I would not leave the house without a journal, a camera, and my favourite novel. In the journal I could record every thought and feeling I have along the way – and it would be a book to treasure forever. I could also use the pages to draw pictures and communicate with those who speak a different language to me. I would take a camera, of course, to record all of the fantastic scenes and people I see and meet – particularly Iduka students and volunteers. Finally, I would take my favourite novel, as it would be like carrying some friends with me on the journey, and may provide some comfort on lonely nights. 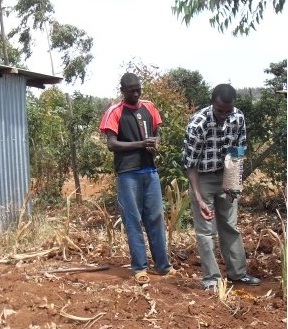 Iduka Partnership with Kisima Initiative in Kenya! Iduka is excited to announce a partnership with Kisima Initiative based in Kenya. 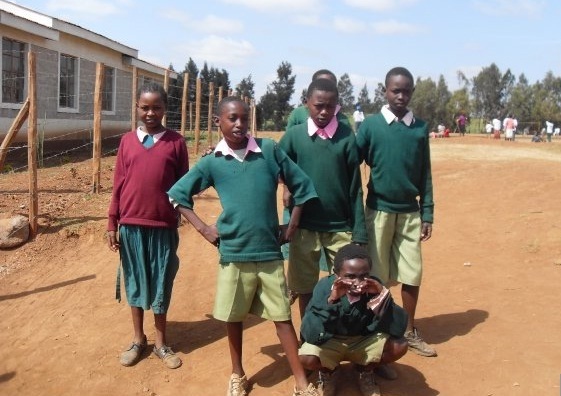 Kisima is a non-governmental, non-profit organisation that provides education and employment schemes for youths living in poverty, along with support for their families. Kisima will be taking on the function of Iduka Field Partner as part of Iduka’s ‘Africa Project’, and will have a central role in the selection, support and development of Iduka’s scholarship awardees! 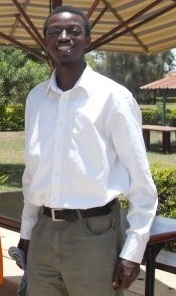 John Ndegwa (pictured) is one of the founders of Kisima and will now sit on the Executive Committee for Iduka, assisting student development in East Africa. No student can benefit from Iduka’s education scholarships without a dedicated Field Partner working on the ground to provide the vital student support. Already John and Kisima have demonstrated their commitment to Iduka’s cause, as they have been instrumental in organising a scholarship for Iduka’s excellent student Neville Albert. This Iduka-Kisima partnership is a fantastic opportunity to open the dialogue on education in Africa – particularly East Africa. The networking and information sharing that will result from this partnership will not only create national and international awareness of the need for higher education in Africa, it will also offer more education, skills and livelihood opportunities for African students on the ground. Kisima Initiative has been working with local communities since 2002 and they offer a variety of development projects including: Youth Support, Orphaned and Vulnerable Children’s Educational Support, Women’s Projects, and Agribusiness. As a Field Partner for Iduka, Kisima will now be able to offer undeserved, underrepresented and underprivileged students in East Africa the opportunity to realise their higher-education ambitions! Jolandie Rust is about to set off on the biggest challenge of her life – in six days she will begin the 40,000km circumnavigation of Africa. Just one girl, just one bicycle. But this challenge means more to Jolandie than physical achievement… along the way she hopes to serve as an inspiration for girls everywhere and spread a message that education is the key to prosperity. Jolandie, as Iduka’s Goodwill Ambassador, will be delivering an open letter to African leaders in each country, asking them to promote and protect higher education in the continent. Education is an incredibly important issue. The second Millennium Development Goal, outlined 11 years ago, continues to call for universal primary education. This crucial education requirement will construct the foundation for secondary school learning, which ultimately provides students with the development needed to progress into further education and the world of sustainable employment. The transformative power of education to break generational cycles of poverty must be recognised! Through education boys and girls can gain the skills and knowledge needed to transform the prosperity of local communities and support the development of their nation. Sadly, the truth remains that Africa has the lowest primary school completion rates in the world and the majority of out-of-school children are girls (UNESCO). 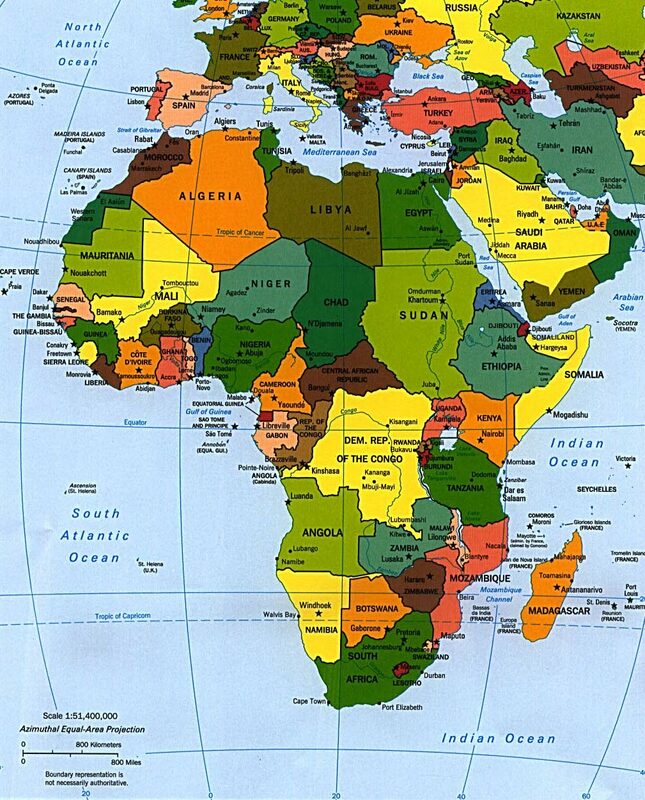 Iduka is currently working with local students and volunteers in all African countries in order to assist African students to achieve their dream of further education. In particular, Iduka will be specifically targeting girls’ education. Jolandie, by representing Iduka, will be giving the campaign a voice. Cycle For Education is not just about pushing the boundaries of solo female cycling, it is also about creating momentum for a cause that so many young boys and girls dream of – higher education!